I like motorcycles. Fast politically incorrect motorcycles. 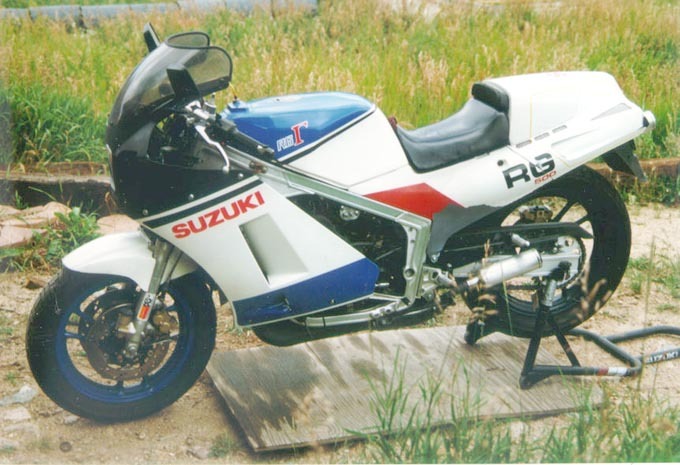 In particular, I like Suzuki's RG-500 Gamma, a stubby looking 2-stroke sportbike with a ravenous hunger for twisty pavement, perhaps one of the craziest motorcycles ever sold for the street (at least in the rest of the world). It is temperamental, slow to wake, loud and sometimes smokey. But did I mention that twisty pavement? Some of the unenlightened Americans in the crowd may be thinking, "that's just a 500, it couldn't possibly compete with a 750 or 1000". Well, think again. 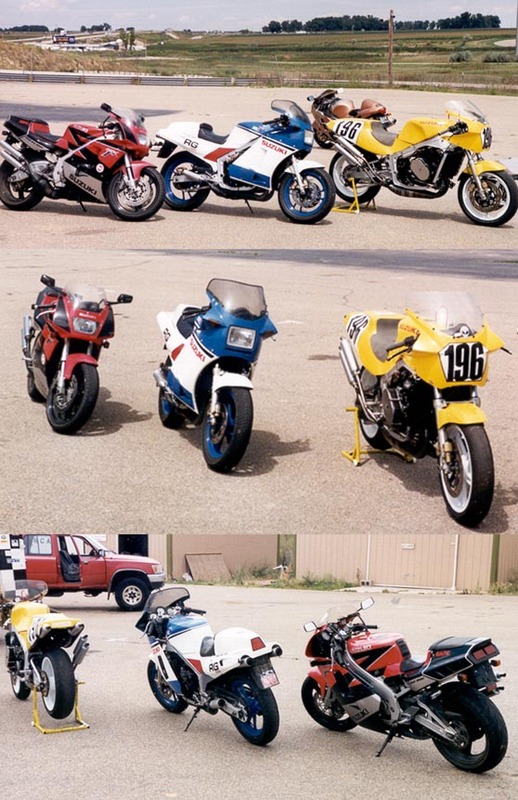 Modern 2-stroke 500cc GP race bikes produced nearly 190 horsepower while weighing less than 290 pounds. Okay, a 1986 gamma is far from modern... (with minor mods) in the ballpark of 100 horsepower weighing around 350 pounds. It may not have the trickest suspension or the widest wheels (though it could$) but that is a LOT of power for a bike lighter 'wet' than any 4stroke. 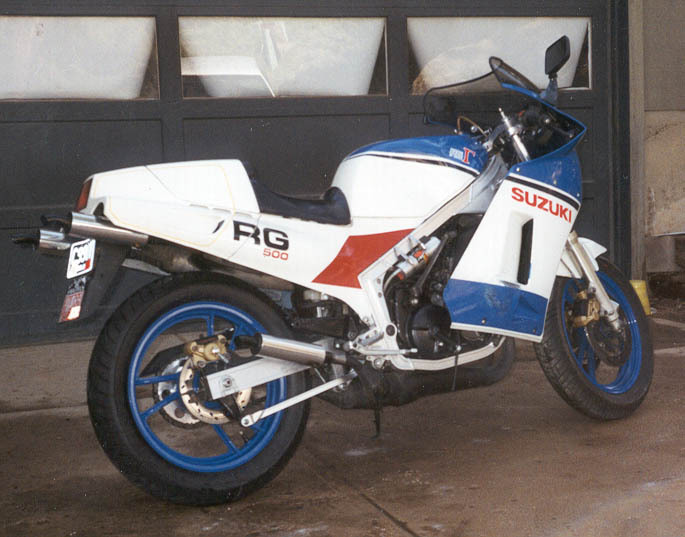 Unfortunately, Gammas and other 2-stroke wonders were never sold in the states after the RZ350 in 1984. A few managed to trickle in and get titled (an advantage of this is that they are not on insurance blacklists and therefore cost the same as generic 500cc motorcycles... cheap). My RG has been through a lot. It was brought in from Canada and raced awhile. 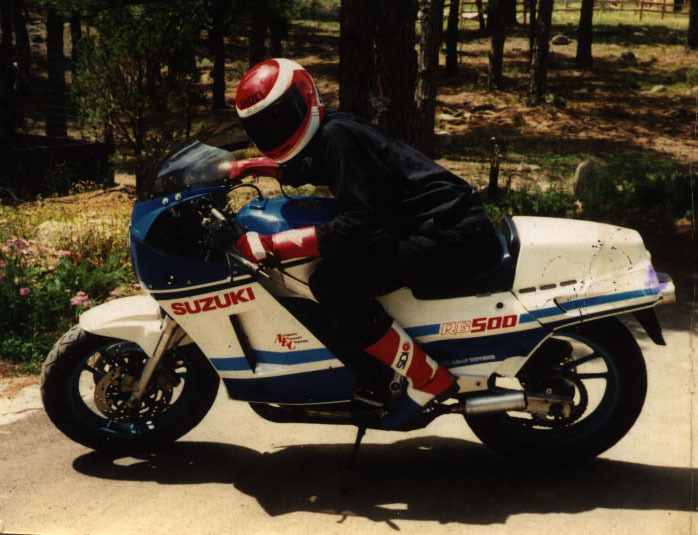 I become the fourth owner in 1989, receiving the bike without amenities like mirrors or signals or connected tail lights. I was fortunate enough to chance across the box containing most of the stripped parts in the back of a local bike shop. 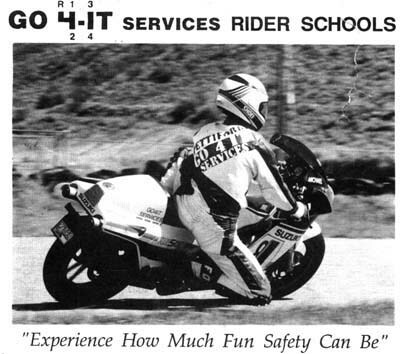 Back then, the bike had low gearing, making it difficult to keep the front tire on the ground in 1st, 2nd and sometimes 3rd gear. 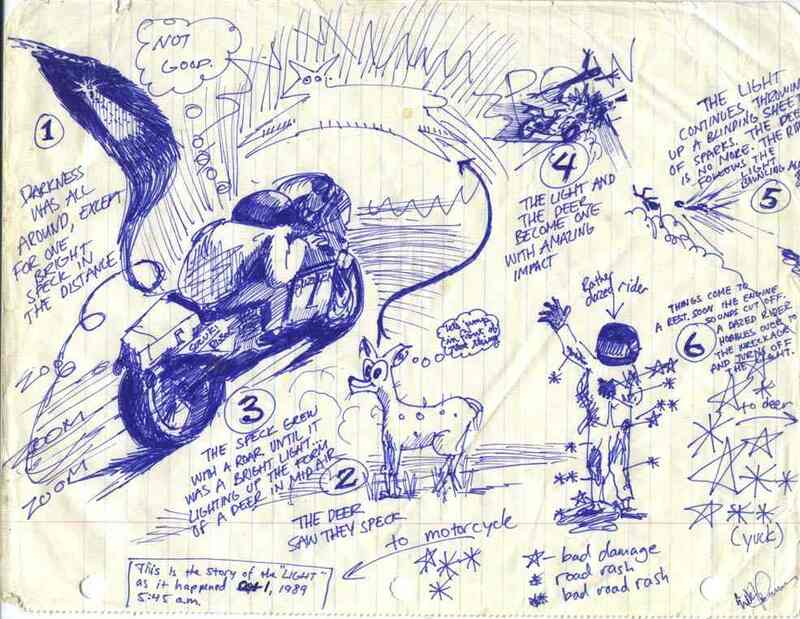 Quite the thing for a fellow whose appetite for speed exceeded his sensibilities. So one day fate decided to refine those sensibilities by placing a deer in midair right where my headlight would be in a few milliseconds. Needless to say, it was messy. It took almost three years to get the bike back on the road, more time to replace all the plastic. 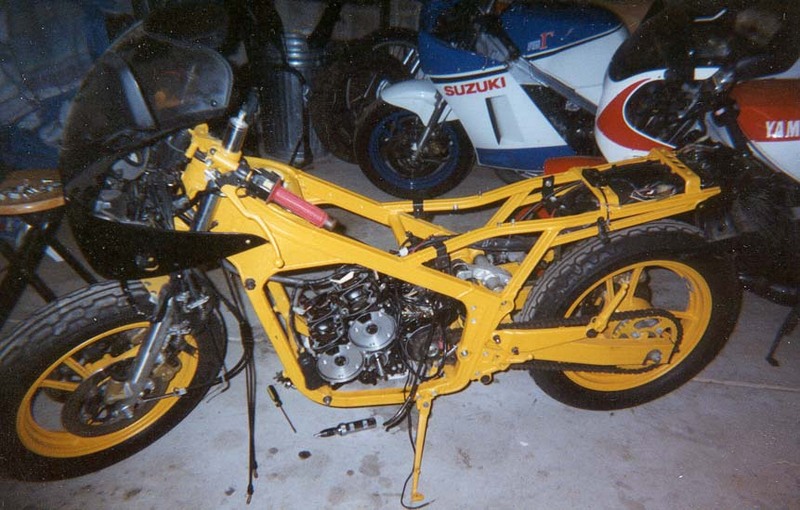 The bike has run great ever since, except for rebuild in 1994 after crank failure, and slightly seizing the motor in 2000 due to 'operator error'. 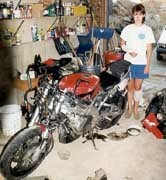 I've rebuilt the motor and the bike is running better than ever (especially after chasing down some jetting gremlins). Thanks to all on the gamma mailing list who've provided invaluable advice and information and great deals on their spare parts. Special thanks to Eric Sweeney, Mark Brown, Doug Holm, Dan DiNardo, Mark Brown, Waldo van de Haar, and others who've saved me *thousands*. Also thanks to Vic Plichota and Dave Batson for the cool cans (replacing the ratty dirt bike cans I had for a decade). Three Gammas. Ours plus Perry Black's modern vintage racer. 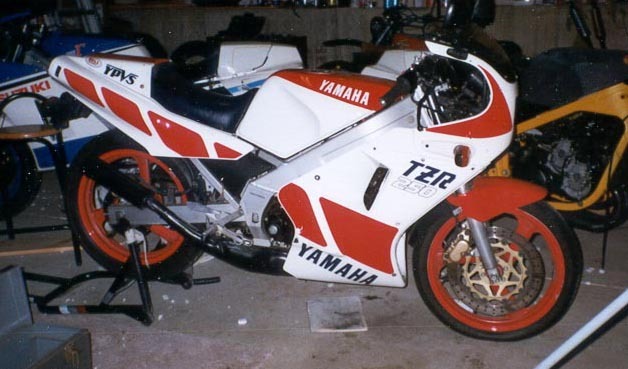 In 1999 my gamma briefly had a little brother, a jap market 1991 RGV-250. Though much weaker than the 500 the 250 is even lighter and handles Much better (with UpSideDown forks, beefier chassis and wider wheels). My wife logged most of its kilometers on street and track before crashing it in Boulder Canyon. She was passing a few cars in a passing zone, and when cars came the other way, locked up the front brake trying to merge and slid down and off the road (between the cars she was passing). I saw it all in the rear view mirror of my bike. She tumbled down the side of the road, injuring her wrist and knee (thank god for good helmet, jacket, boots and gloves). The RGV fared less well, shooting off the embankment, over the creek about 150ft before hitting a rock dead on with the rear wheel and then tumbling end over end down the creek. 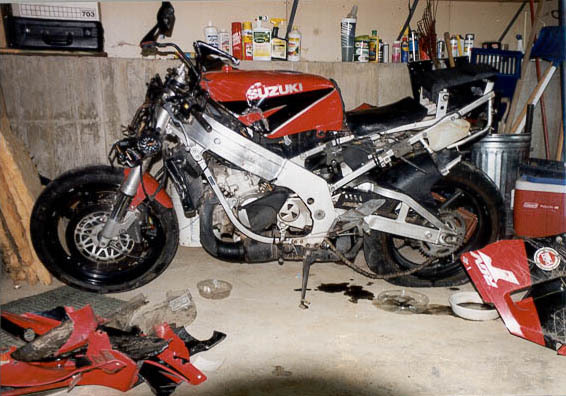 The frame is bashed, the swingarm bent, the rear wheel in 3 or 4 peices, all fairings pulverized, gauges smashed, triple clamp dented, forks scratched... what a mess. This RGV's remains are now scattered around the globe from Canada to New Zealand. Shara's detailed account of the crash is on her website. 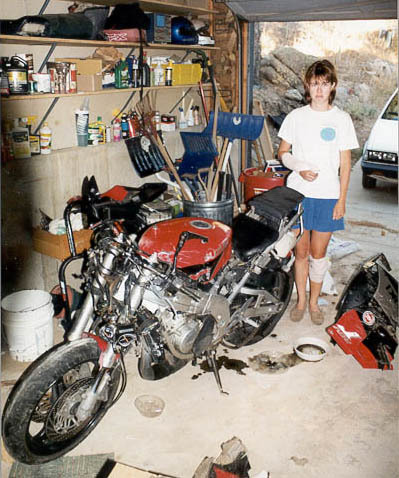 My wife long since full recovered from the crash, and is now honing her skills on a 1988 TZR 250 that was cheap and practically in our backyard. 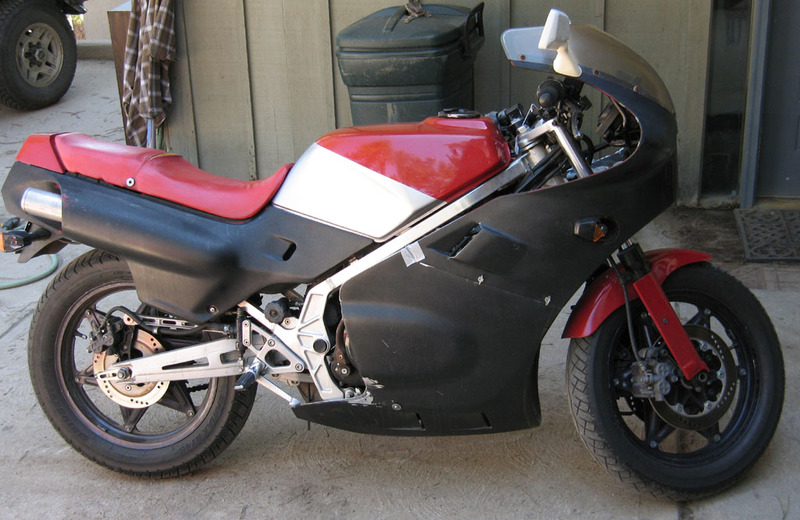 It is peppy, superlight, and Shara now loves it and would never want another RGV (though I am less picky). 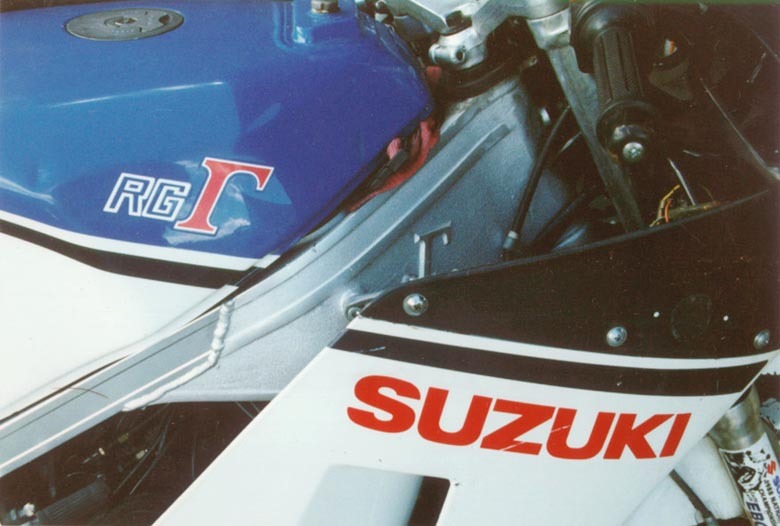 The TZR was built in an era where human comfort was still a design issue and Shara enjoys the lack of the agony the RGV could cause. 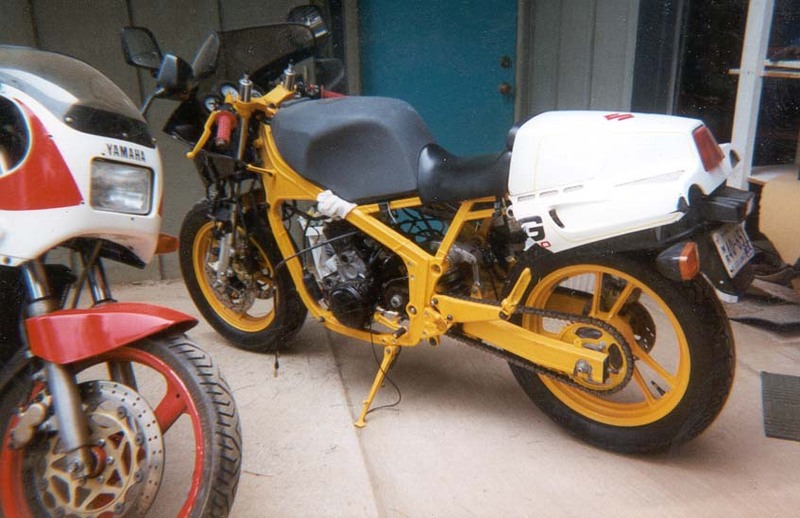 In 2006 we bought a 1983 Honda NS250R off of craiglist because it was dirt cheap and local. It was ugly, badly rich and loud (way louder than the RG!). 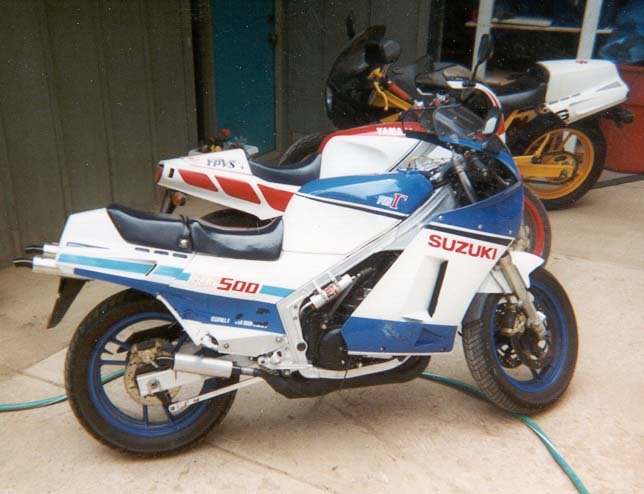 This seems to be so rare a bike there is almost no mention of it anywhere on the internet! But fortunately it is identical to the NS400R but just has two cylinders instead of three... so some parts availability. It feels faster than the TZR but is slower. 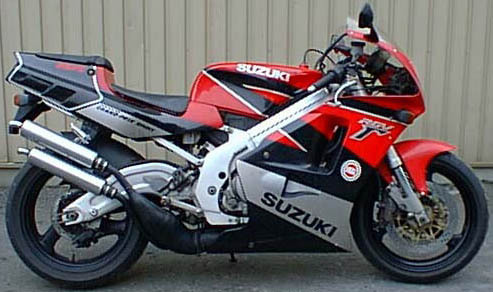 It feels lighter than the TZR but is heavier. 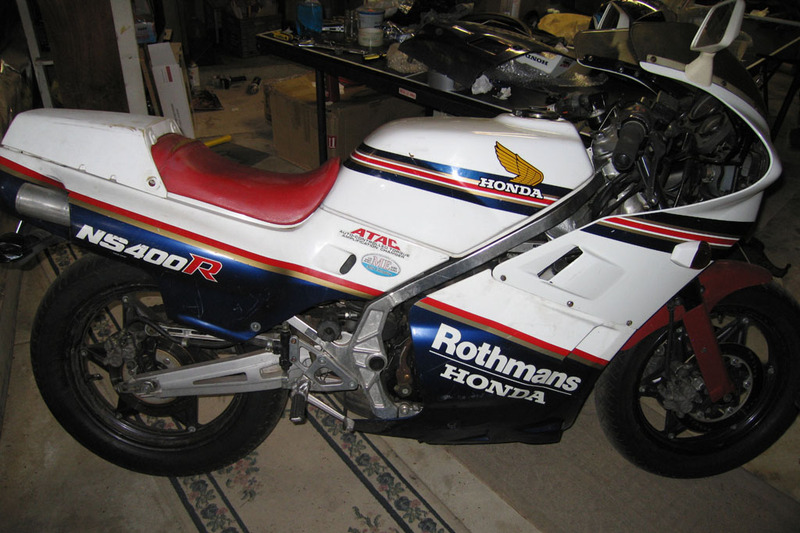 It handles much better than the TZR and RG, more like the RGV did (but still with that 80s comfort). It no longer is quite as loud with the airbox reinstalled, and thanks to Karl Avetoom at RG500.com it looks a bit prettier sporting a mix of NS250R and NS400R bodywork. Jetting has improved but needs more work. 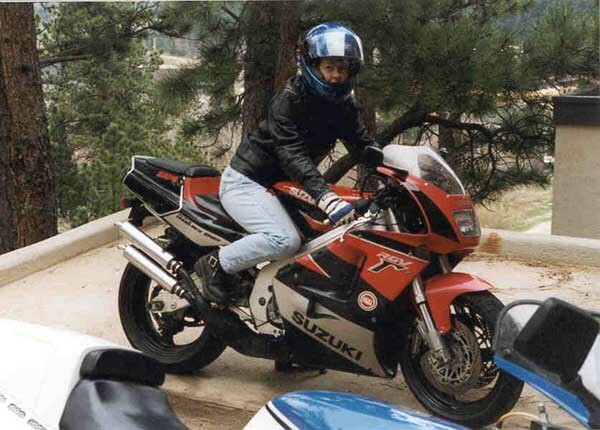 Shara prefers the TZR and I find it hard to choose not to ride the RG so it doesn't get much use, but is still an interesting 2 stroke sportbike and handy for visitors. In Spring 2007, we spent 4 days in Greece riding RGs (and RD/RZV) with the famous Rigas of the gammalist. You can read my account and see pics on the RidingWithRigas page. Greece, particularly Athens is a lawless world of motorcycle craziness among some of the densest and fastest traffic I've ever seen (and I've been to China). Our speeds of up to 220kph seemed fast but were rather pedestrian as we were regularly passed by bikes going much much faster. The cops will just smile at whatever you do and clean up whatever is left of you.